The tropical disturbance that has been offshore for days has quickly organized overnight into tropical storm Kenneth (unofficially) Deep convection has increased enough to say that 12 E should be classifiend as a tropical storm. It will move inland this evening in southern Mexico which will halt strengthening. 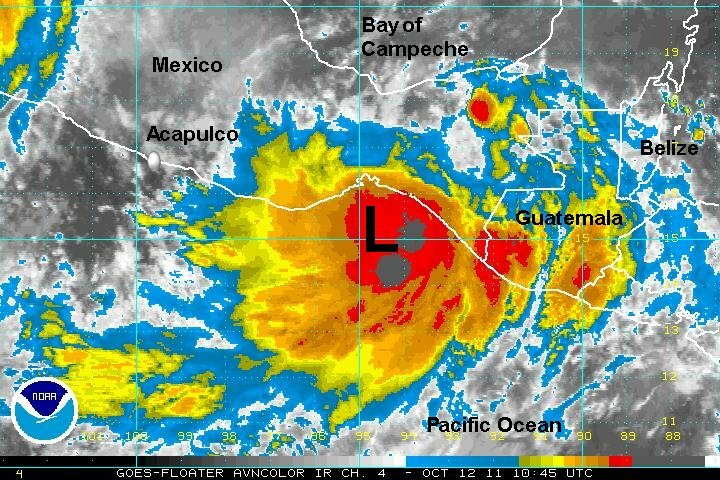 As of 8 am edt / 5 am pdt Kenneth (12 E) was centered near 15.2 N / 93.5 W or about 125 miles se of Salina Cruz, Mexico. Movement is north at about 5 mph. Top sustained winds are estimated at 40 mph (NHC 35 mph earlier advisory). Pressure is estimated at 1002 mb. Kenneth will have a short life span as it is forecast to move north and be inland in about 12-18 hours in southern Mexico. 12 E has moved inland. It appeared that there was sufficient data to classify 12 E as a minimal tropical storm this morning. It is now weakening over land.